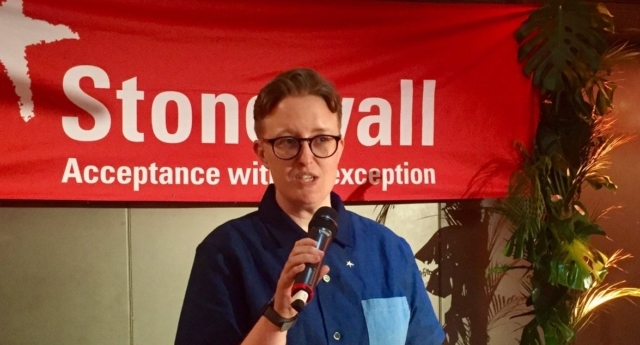 Stonewall CEO Ruth Hunt gave her unequivocal support to the transgender community at the charity’s summer party in London on Thursday, telling a gathered audience of activists, media and influencers that it’s time for the LGBT+ community to be vocal about on trans rights. Hunt’s support for the trans community comes after a group of radical lesbian activists hijacked last week’s Pride in London parade to protest against transgender rights. This includes proposed reforms to the Gender Recognition Act which would streamline the process for transgender people to legally change their gender. The government began a consultation on reforming the act earlier in July. “As a cis lesbian who has for a long time stated unequivocally stated trans women are women and trans men are men, I know the vitriol that evokes in some parts of our community,” Hunt continued at Thursday’s Stonewall event. On Sunday, Hunt condemned Pride in London organisers for failing to protect trans people taking part in Saturday’s celebrations by allowing radical group Get the L Out to effectively overtake and lead the parade. “That a transphobic group who are actively working against the community were able to walk the length of the route, that they faced no obstruction and were able to distribute leaflets filled with myths and lies, is hard to believe,” wrote Hunt. Hunt continued: “Facing up to your privilege isn’t easy. But it’s essential because ignoring it can lead you to make assumptions and decisions that put people in danger. “Yesterday was a demonstration of that in action, with a transphobic group able to protest unhindered in the interests of the ‘safety of everyone’. Not everyone was safe – trans people were left feeling exposed and alienated by their own community.